In an effort to unite the Kingdoms with a marriage between Prince Edward of England and Princess Mary of Scotland, the Battle of Pinkie (1547) saw a resumption of the Rough Wooing. 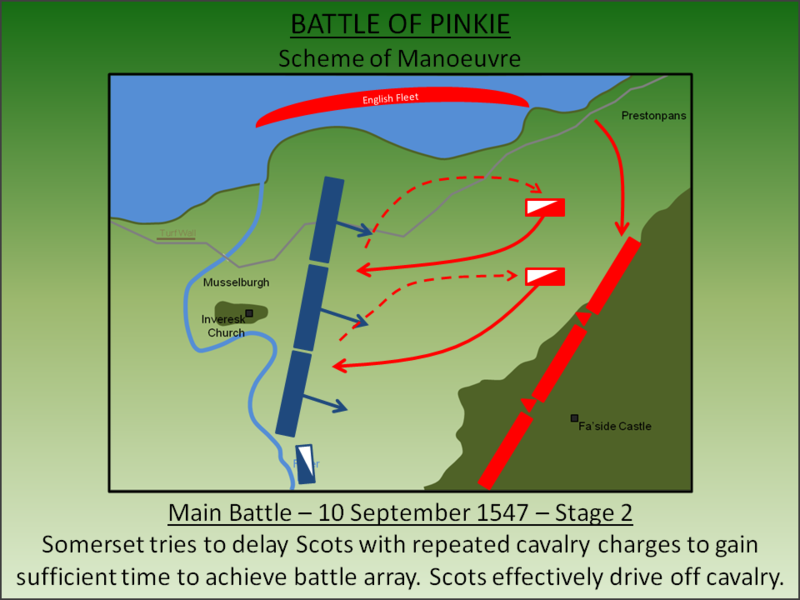 The invading English were attacked by a larger Scottish force but destroyed it through formidable fire-power. Nearby Fa’side Castle was burnt as the English withdrew. When James IV of Scotland and Margaret Tudor, daughter of Henry VII, married in 1503 the English King allegedly mooted that one day it may result in a unification of the two Crowns. If so he was right for one hundred years later Margaret’s great grandson, James VI, would become King of both countries. But by the late 1540s there was no clear indication this outcome would ever be achieved; Henry VIII had finally had a legitimate male child and it looked like his dynasty would thrive and diverge from that of his sister. Furthermore warfare between the two countries still blighted both their fortunes - the Battle of Solway Moss had been fought in November 1542 following Scotland’s refusal to follow England's lead breaking with the Church of Rome. And only a few decades earlier James IV had invaded England in support of the 'Auld Alliance' with France. To the medieval (English) mind a merger of the two Kingdoms was the only viable solution to ensure an unhindered effort against France. The infants Prince Edward (later Edward VI) of England and Mary (later Mary, Queen of Scots) in Scotland made such a potential union viable. The warfare of the early 1540s, culminating in the Battle of Solway Moss (1542), was brought to an end by the Treaty of Greenwich. Part of this was a marriage proposal between Prince Edward and Mary which planned to unite both Kingdoms albeit with Scotland retaining its own laws. Although the Treaty was accepted by the Scottish Regent - James Hamilton, Earl of Arran - it was decisively rejected by the wider Scottish nobility. As a result on 11 December 1543, Henry VIII declared war on Scotland; the 'Rough Wooing' had commenced. The English invaded in May 1544 with an army under Edward Seymour, Earl of Hertford attacking and burning Edinburgh. A Scottish victory at the Battle of Ancrum Moor in February 1545 brought a re-think in English policy with peace between the two nations although internal religious tensions continued. During this period St Andrews Castle was attacked and taken by a Protestant force with the pro-French Cardinal Beaton lynched. In January 1547 Henry VIII died and was succeeded by his nine year old son, Edward VI. The Regent during his minority was Edward Seymour, now elevated to Duke of Somerset, who continued the push for an English-Scottish marriage and was infuriated by what he regarded as intransigence by the Scots. Furthermore French military aid had been engaged in Scotland suppressing Protestantism; in 1546 a French naval force had taken St Andrews Castle resulting in the enslavement of John Knox. Somerset mustered his forces at Berwick-upon-Tweed and invaded Scotland advancing along the coast into Lothian supported through by the English Navy under Lord Clifford. In response Arran mustered his forces at Edinburgh and moved east to intercept. Initial skirmishing took place in vicinity of Dunbar but the two forces were not in the immediate vicinity of each other until 9 September. Arran drew up his men into a strong defensive position stretching from the water to the high ground to their south completely blocking the Edinburgh road. Crucially he also controlled the bridge over the River Esk over which the coastal road travelled. To continue their advance to Edinburgh the English would have to attack the entrenched Scottish position. Arran had his troops closest to the sea construct an earth bank to their north to protect them from artillery fire from the English ships. Arran had assembled a significant force numbering around 22,000 men although their cavalry detachment was small at just 1,500. The bulk of the infantry was armed with pikes - formidable weapons provided they could be used in an advancing formation. Somerset had a smaller force probably in the region of around 18,000 men. However this was a balanced and professional army - 13,000 infantry included detachments of mercenaries and pioneers whilst almost 5,000 troops were mounted. Their infantry was armed with a mix of bills, pikes, longbows and light firearms. Crucially just offshore, within easy artillery range, was Lord Clifton and the large English Navy. The Scots had nothing to match this since imprudently selling off James IV's fledgling naval force following that King's death at Flodden. The main battle was fought over a two day period between the 9-10 September 1547. On 9 September the English arrived and camped at Prestonpans under the protection of the guns of the English fleet. The Scottish cavalry, under Lord Home, crossed the River Esk and had taken Falside Hill to the south of the English camp. After some initial reluctance, Somerset deployed his cavalry to dislodge the Scots and with greater superiority in numbers easily took the position. Lord Home was captured and Arran’s already limited cavalry component was effectively neutralised. 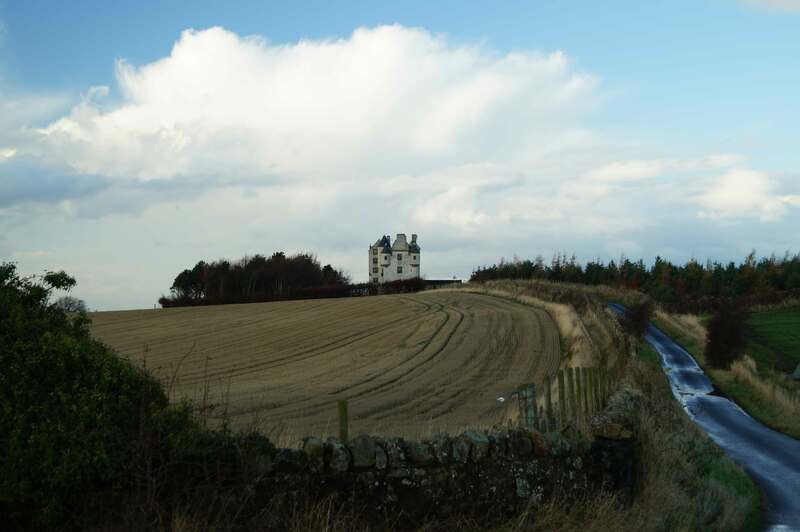 Nearby Fa'side Castle remained occupied by Scottish forces but were isolated and the garrison was too small to cause trouble. 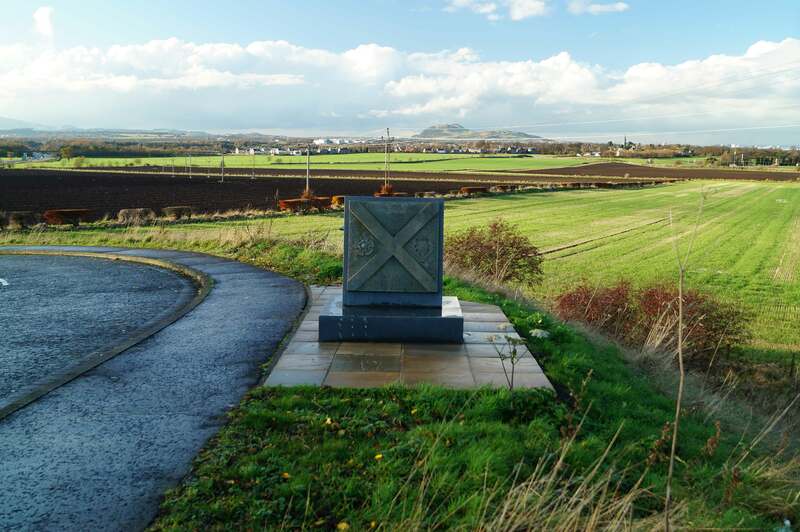 Around 8am on Sunday 10 September Somerset moved his forces out of Prestonpans planning to take the high ground to the south and also to capture Inversesk Church to use it as an artillery platform from which he could attack the Scottish camp. Arran however pre-empted him and moved from a defensive posture to an offensive one; he advanced his forces across the River Esk and forward against the English positions. Somerset sent his cavalry into action attempting to delay the Scots to buy him sufficient time to configure his army into full battle array – the vanguard, the main-guard and the rear-guard - all with archers on the left and hagbutters (the hagbut was an early form of musket) on the right. 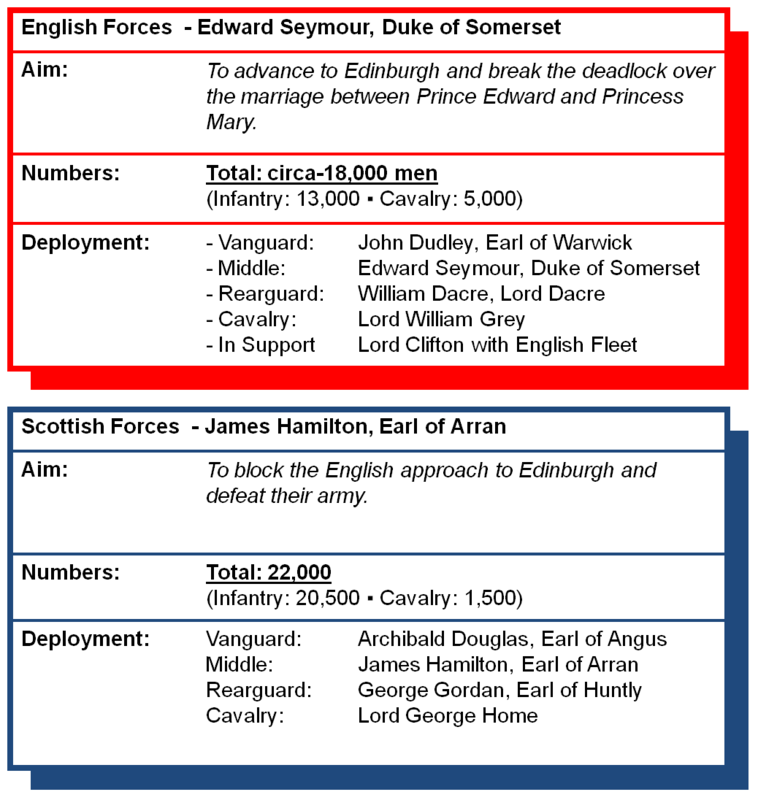 The Scots however effectively drove off the English horse and continued their advance on the English lines. 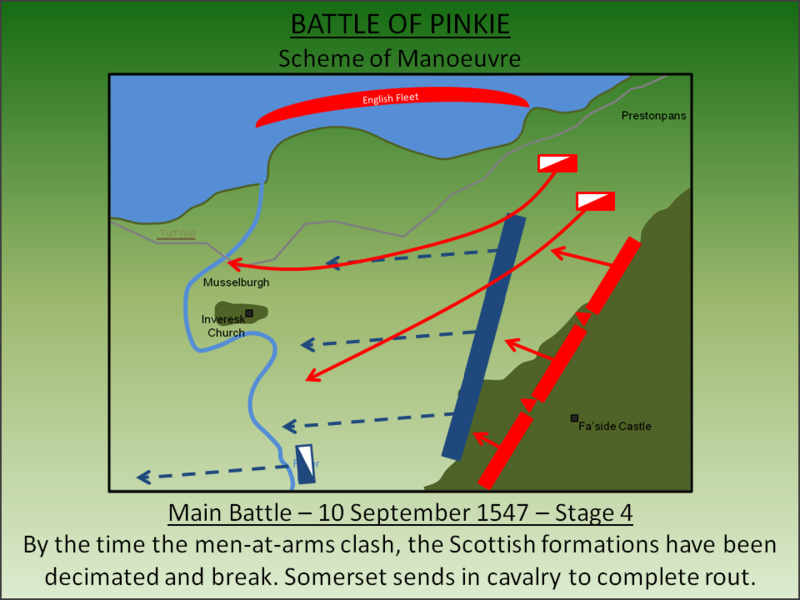 The English cavalry's attack had not been in vain - the dead and dying horses and men made obstacles around which the advancing Scottish pike formations had to manoeuvre causing their formations to forge into a dense mass rather than individual battles. Nevertheless Arran kept his forces on the move - provided they could maintain forward momentum then they had sufficient numbers to break the English lines. Their dense formation came under the full weight of fire from Somerset's lines - hagbuts, longbows and artillery pieces within the infantry formations - all concentrated their attack on the Scottish advance. Furthermore, having now moved from the safety of the earthwork they had dug for their defence, the advancing Scots were now visible to the English fleet who opened fire with their massed broadsides of heavy artillery. 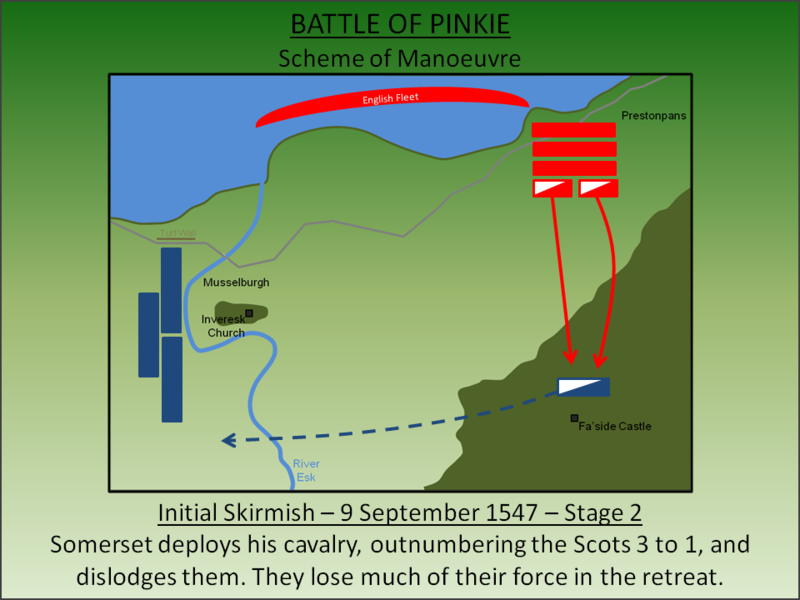 By the time the Scottish forces had reached the English frontline their cohesion - so critical for the success when using pikes - had been broken. The bulk of the forces broke and those that attempted a fighting withdrawal found the pike to be an ineffective weapon for supporting a retreat. Somerset sent his remaining cavalry into pursuit and the rout was complete; perhaps as many as 6,000 Scots were killed in the retreat with a further 1,000 captured. The battle was a resounding tactical victory for the English and is noteworthy for being the first battle where gunpowder artillery played a decisive role and also the last pitched battle fought between England and Scotland (when excluding events of the Wars of Three Kingdoms). However, despite being an immediate victory for the English, the campaign ultimately failed. Despite having destroyed the Scottish army, Somerset was unable to capitalise on his success and lacked resources to build and sustain the garrisons that would have been needed to control the country. No further battles were fought in the war and peace was agreed with the Treaty of Norham (1550). 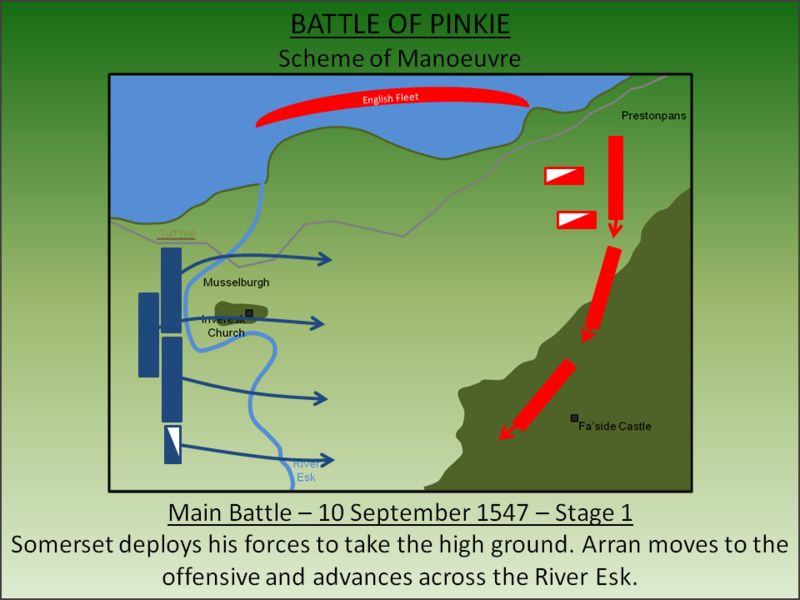 Following the defeat at Pinkie, Mary was moved to the relative safety of Dumbarton Castle and entered into negotiations with the French for a marriage between the young Scottish Princess and the Dauphin of France. A French warship whisked Mary away from Dumbarton in August 1548 and she would spend the next 13 years in France where she later (1558) married the Dauphin, Prince Francis (later Francis II). In 1603, with the death of Elizabeth I, James VI of Scotland succeeded to the throne of England uniting the countries to the current day. Battlefields Trust. Battlefield Report: Pinkie 1547. Battlefields Trust. Fergusson, J (1947). 1547: the Rough Wooing. Blackwood's Magazine no. 262, London. Lancaster, J.H.D (2014). Pinkie: Battlefield visit notes and observations. CastlesFortsBattles.co.uk. A large portion of the battlefield remains undeveloped and the visitor can certainly appreciate the general terrain. Fa’side Castle, although extensively restored and now hidden by trees, is also visible albeit now a private residence with limited access. Monument. A small monument has been erected at the English position near Fa’side Castle. It was near here that Lord Home’s cavalry was dislodged on 9 September 1547. Battlefield. Fa'side Castle was located on the high ground. Battlefield. Inveresk Church can be seen in the distance of this photo (off centre) which Somerset intended to capture to use as an artillery platform. Fa'side Castle. After the English victory Fa'side Castle was burnt but later rebuilt. Inveresk Church. The church has been rebuilt since Tudor times. Somerset intended to seize the original structure in order to bombard the Scottish camp. The monument is situated off the A6094 Salters Road on quiet dead-end that has on-road parking for visitors. Fa’side Castle is nearby (visible from the monument) but is private property with limited access. However there is a public (single track) road that leads off Salters Road enabling the visitor to get near the castle.